Do you provide transport to the pick-up location from the airport or hotels? CanaDream bietet gerne einen Shuttleservice zwischen unseren Standorten und den lokalen Flughafen- und Flughafenhotels an. Guests should call the pick-up location to pre-book their transfer after 8am on the morning of pick up. Passengers using the transfer service are allowed 1 suitcase and 1 hand luggage item per Guest. Note: Unfortunately due to space restrictions in our transfer vehicles we are unable to guarantee the transfer of bikes, large sports equipment or excessive luggage. Please call to discuss your transfer requirements and we will advise if this is possible, otherwise a private transfer (at own cost) will need to be arranged. CanaDream is happy to offer a transfer service or a paid private taxi service as outlined below. Downtown transfers are not available, except in Whitehorse. Guests should call the pick-up station the day before pick up or after 8 am on the morning of pick up to pre-book their transfer. Guests will be told the time to be ready for the Canadream shuttle and where to meet it. Drop-off transfer will be arranged at time of drop off. Passengers using the CanaDream transfer service are allowed 1 suitcase and 1 hand luggage item per Guest. Note: Unfortunately, due to space restrictions in the CanaDream transfer vehicles, we cannot guarantee the transfer of bikes, large sports equipment or excessive luggage. Please call us before pick up to discuss transfer requirements and we will advise if this is possible, otherwise we will be happy to arrange a private transfer at the Guest’s own cost. Guests should call the pick-up station the day before pick up or after 8am on the morning of pick up to be given a check-in time. Guests should then plan to arrive on time at the station according to their scheduled pick-up time. The taxi reimbursement will be processed at check in. Guests must present their taxi receipt at check in to verify their transfer was from the airport or airport hotel (and downtown for Whitehorse). Note the Private Taxi offer is only applicable for the stated stations and strictly from the airport or airport hotels. CanaDream will arrange for the drop-off taxi. What time do I need to return my vehicle? Normal drop-off times are between 08:00 and 10:00. You do not need to book a time to drop-off your vehicle. Please ensure you are back at your drop-off location and all your possessions are removed from the vehicle no later than 10:00. If you have a late drop-off, this will be noted on your Rental Agreement and, in this instance, you may return your vehicle anytime before 15:00. How long will the drop-off process take? Solange das Fahrzeug in einem sauberen, unbeschädigten Zustand mit allen Einrichtungen und Zubehör (und mit leeren Wassertanks) zurückgegeben wird, dauert die Rückgabe ½ Stunde. If you require a ride to the airport or to an airport hotel, additional time may need to be allocated for the shuttle transportation. Do I need to empty the holding tanks at the end of my trip? Yes, unless you have purchased our optional Platinum package at pick up, both the gray and black water tanks must be emptied at an appropriate dump station before the unit is returned. If the vehicle is returned without being emptied, a charge applies. See our current pricing sheet for more details. Do I need to return the RV with a full tank of fuel? You will receive the vehicle with at least ¼ tank of fuel. You must return it with the fuel at the same level as pick up or you will be charged a fuel fee. Propane tanks may be returned empty. We do not offer a refund if the vehicle is returned with more fuel than at pickup. The Vehicle Specification page on our website provides you with the fuel tank capacity for each of our vehicle types. You are welcome to use this as a rough guide in calculating the number of litres required to return the vehicle at the same fuel level as pick up. How clean does the vehicle need to be when I return my rental vehicle? Guests are required at pick up to read and sign our "Before you drop off your RV" document. This document is available in English, French, German and Dutch. If there is any discrepancy between the wording on the English document and that on the French, German and Dutch versions, the wording on the English version will apply. Please sweep out the RV, ensure the fridge is empty with any spills wiped out, and that the stove is wiped down so it is free of grease. If you have not purchased one of our optional "We are happy to" packages at pick up and choose not to clean your RV prior to drop off, cleaning charges will apply. Will I be charged if I drop off my RV late? A late drop-off fee will be charged for each hour the vehicle is not returned on or before the drop-off time stated in your rental agreement. The maximum charge for late drop-off will not exceed $600.00 for each 24 hour period. Will I get a refund if I return my RV early? Sorry. We are unable to offer you a refund if you decide to drop off your RV before the drop-off date shown in your rental agreement. I bought too many prepaid kilometres. Can I get a refund? We recommend that our Guests use the planning tools on our website to calculate the approximate number of kilometres they will require for their vacation. As we do not provide Guests with refunds for unused kilometres, we suggest that Guests do not pre-purchase more kilometres than they calculate they will need. What do your "We are happy to" packages include? We are happy to offer our Guests optional packages to enable them to have peace of mind on their RV vacations and enjoy their holiday until the last possible moment. 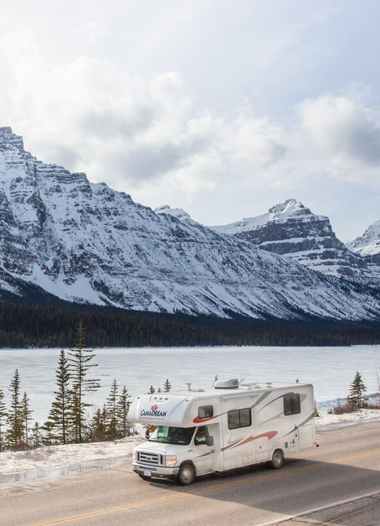 Our "We are happy to" options range from windshield coverage to bringing the RV back without emptying the grey and black water tanks or cleaning the interior or exterior of the vehicle. Please view our "We are happy to" leaflets here in English, French, German and Dutch for complete information on inclusions.